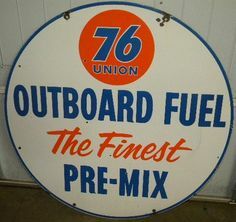 The 76 Union Outboard Fuel sign is round in shape and had orange, blue, and white colors. This porcelain sign features text that reads “76 Union Outboard Fuel The Finest Pre-Mix” in orange and blue letters. The small 76 Union logo is in the center top of the sign.